Save yourself hours and get organized fast. (Word Template) Make sure you have this handy tool ready to send to your prospective clients. A great way to impress clients before you meet them. (Word Template) This document is an essential component to closing a sale. Have a one-page summary version of your programs ready to go during every complimentary session that you conduct. (Word Template) Every business needs a letterhead template. Whenever you start a new document, use this template to ensure that every message you send out aligns with your overall corporate branding. (Word Template) Writing your first proposal can be a daunting task but with this template you won’t have to worry about starting with a blank page. This template gives you the framework you need to get started, including: headings that you need, suggested content and a draft text that you can tweak. All you need to do is tailor the message to meet the requirements of your client and press save. 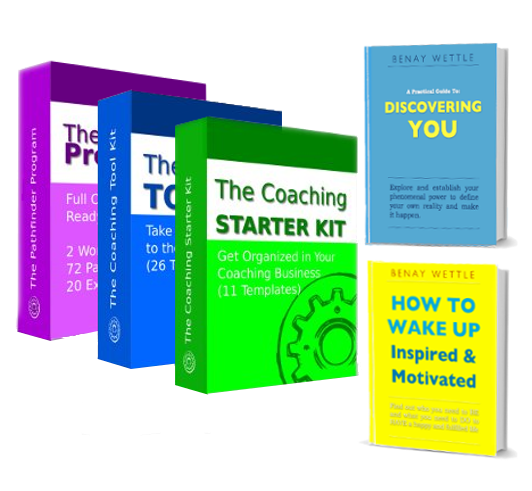 The proposal template is also, of course, formatted to align with all of the other documents within the Coaching Starter Kit™ so that you are able to deliver a consistent brand image to your clients at every stage. This template is scalable: we have used it for one-on one coaching programs, team trainings and large corporate coaching initiatives. 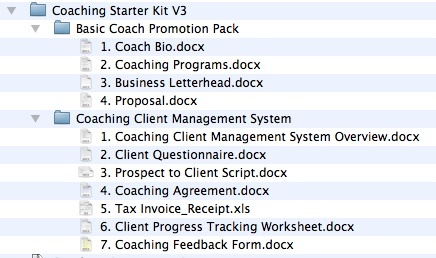 (Word Template) This system outlines the end-to-end process for a new one-on-one coaching client. 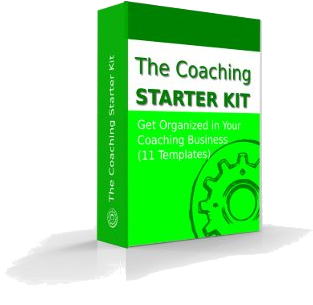 It gives a complete overview of how all the templates and forms included in the Coaching Starter Kit ™ allow you to process a new coaching client from start to finish. (Word Template) Take the time to learn even more about your client before your first paid coaching session with them. The Client Questionnaire consists of 17 exploratory questions that provide both you and the client with the detailed information you need to build your relationship even further. Feel free to change and add questions to your heart’s content. (Word Template) Getting your first session right is critical to your coaching career. This questioning model guides you through that very important session. Its aim is to convert leads into paying clients and it works a treat! (Word Template) It is up to you to make sure that your business complies with the coaching code of conduct. We use this form at the start of each coaching relationship to make sure that we cover off the essentials and to ensure that the client and the coach are on the same page. (Excel Template) It is not a very exciting item, but every business needs a tax invoice/receipt. Here is the one we have been using for years. Simple and effective. Just insert your business details and you are ready to start selling! (Word Template) We got this idea from a ballroom dancing program. It’s a worksheet that you print out and have in each client file. At the end of each session you make a short record of the session. You can have a look at it before each session to get a snapshot view of the overall progress. Deceptively simple, it is one of our favorite tools. (Word Template) This is an invaluable form that you email to your clients at the end of their coaching program. You should always collect feedback from your clients as it not only helps you to track your own evolution as a coach but it is also a great platform for collecting testimonials (which are awesome to have on your Coach Bio/Resume, website and other marketing material). We hope that you will stand on our shoulders and use these tools in your business. Please feel free to change the templates as much as you like to give them your unique mark in order to work even better for your clients.